Anyone who loves to garden knows how much of a pain it can be from time to time. Enjoying the flourishing plant life is fabulous, but a lot of hard work and sweat has to go into a garden before any fruits of your labor can be cultivated. 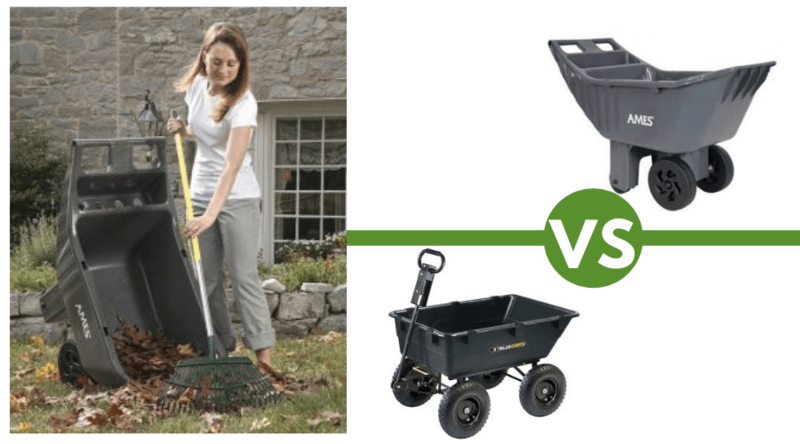 One of the most essential tools of a garden is a type of wheelbarrow, but when it comes to a wheelbarrow vs a gorilla cart, which is best? A wheelbarrow is more traditional and classically designed, but are sometimes prone to rusting. A gorilla cart is rugged and sturdy, but may be a bit too bulky depending on what you need it for. 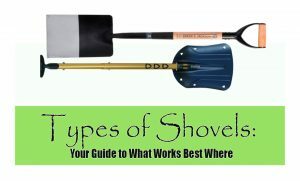 If you’re not sure which tool would best suit your outdoor needs, just read on to check out some useful information that could help you come to a decision. 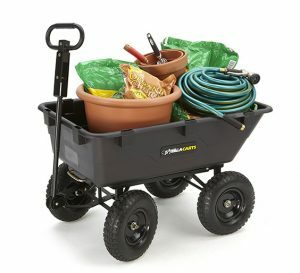 A wheelbarrow is a traditional tool used in building and gardening to help haul materials like soil, mulch, compost, etc. It is a single wheel cart that has two supporting legs and two handles at the rear to help the user move things more efficiently. 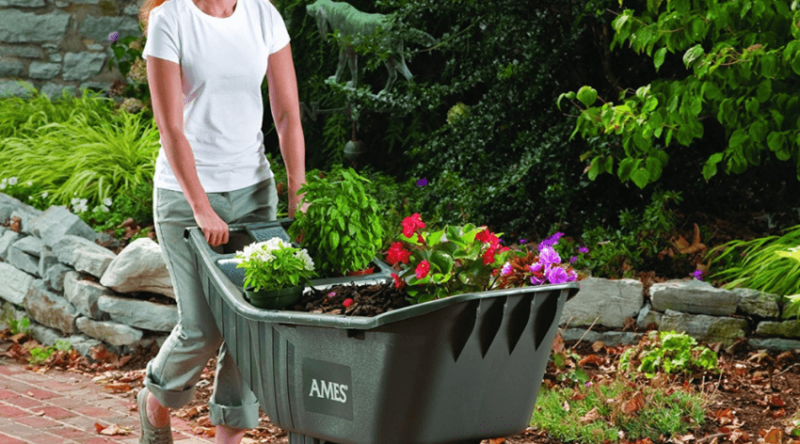 The wheelbarrow has a plastic, steel or aluminum basin that comes in various sizes dependent on the type of wheelbarrow you need. You can typically find steel wheelbarrows on building sites and in larger gardens since the basin is built for more heavy duty work. 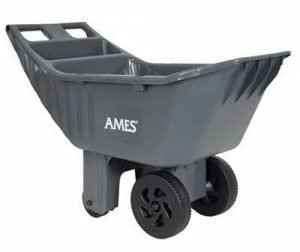 Some people prefer plastic wheelbarrows over steel ones since plastic basins will not rust and are typically lighter and easier to maneuver. 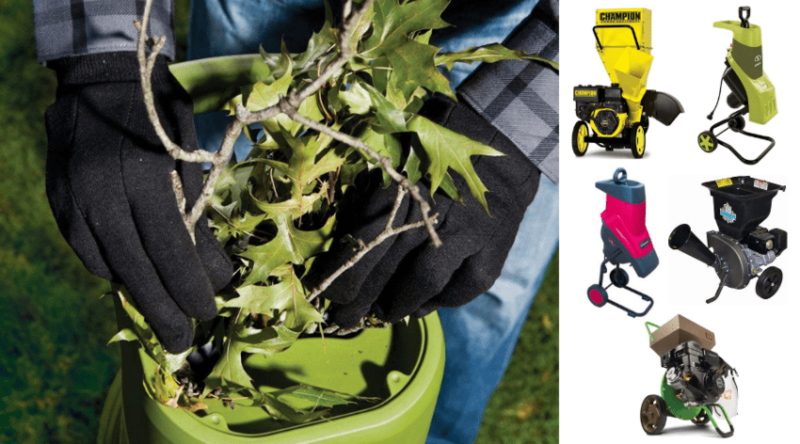 Each type of wheelbarrow has its pros and cons, but you’d really need to determine what kind of jobs you’d need the wheelbarrow for before you decide on a plastic or steel basin. Wheelbarrows are great when you need to move something quickly across the yard or building site. They are versatile in design and with so many to choose from, you can easily find the perfect wheelbarrow for almost any job. 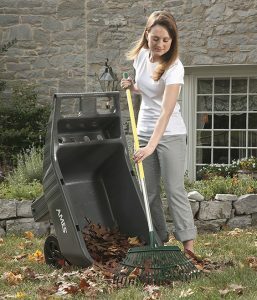 As stated earlier, the most common types of wheelbarrows are plastic or steel. Plastic wheelbarrows are easier to move around since they are lighter. Steel wheelbarrows, however, do tend to be a bit sturdier in that they can carry a heavier load without buckling or folding inward. Wheelbarrows are a classic garden tool and you can find them pretty much anywhere a job requiring the hauling of materials is. 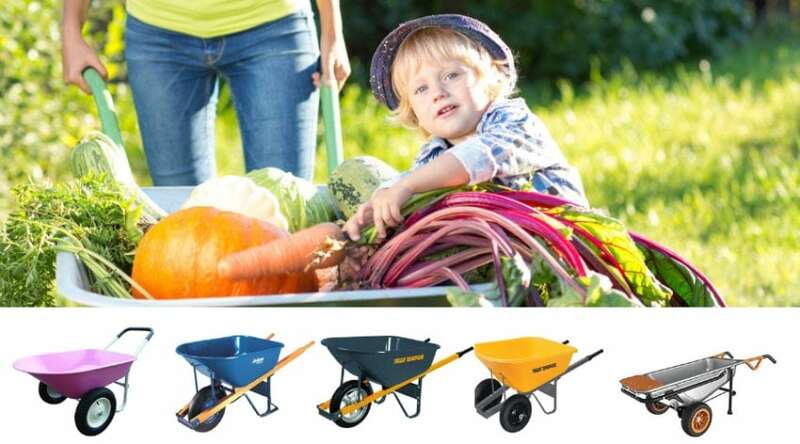 Wheelbarrows are great for moving bricks, wood, gravel and other types of building materials. Using the two handles, the load can easily be moved with ease due to the classic one-wheeled design. One of the biggest drawbacks in using a wheelbarrow is that it can be hard on your back. 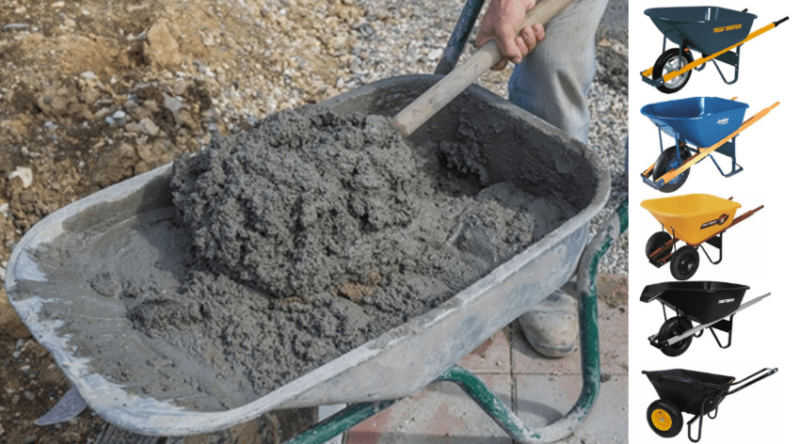 Especially if you are handling a heavier load, such as bricks or rocks, the wheelbarrow could essentially cause great harm if it’s not used properly. You do have to use your back muscles in order to move the wheelbarrow, so if it’s not lifted right, you could end up injuring yourself pretty badly. Another major drawback in using a wheelbarrow is the wear and tear. Steel wheelbarrows will rust if left outside in the rain or snow. It’s important to remember to move the wheelbarrow under some protective covering to protect it from the elements, such as a patio or garden shed. Plastic wheelbarrows can also experience weather damage and become brittle from sun exposure. It’s important to make sure your wheelbarrow is kept in a dry, shaded area if you can’t keep it under a patio or in a shed. 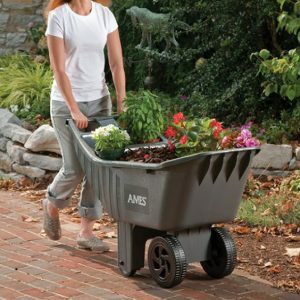 More like a garden cart, a gorilla cart has four heavy duty wheels with a deep, poly bed with steel framed basin. It typically has a 600 pound capacity, but comes in various sizes depending on what you need it for. The gorilla cart has a dump release feature that acts like a dump truck would. It has a switch that releases the bed backwards to quickly and easily dump gravel, soil or any other kind of material that needs to be dumped. 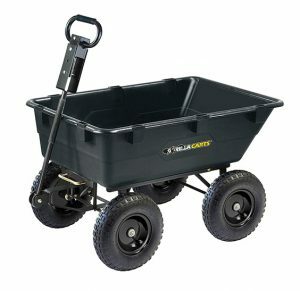 The large, ridged tires are good for moving across difficult terrain and pulling the gorilla cart is typically effortless. The gorilla cart can be purchased in various weights and sizes depending on how heavy duty the job is. Lighter versions are also available for gardening and household requirements. Instead of having to lift the tool, you can just pull it by the handle, saving your back and arm muscles. For exceptionally heavy loads, the cart can both be pushed and pulled depending on what the material is. The deeper the basin, the heavier the load will be, so keep that in mind when looking for the perfect cart for your needs. Since the gorilla cart has a steel frame and poly bed, the product shouldn’t rust, but it would be best to keep this in a garden shed or patio to protect it from the elements. Some setbacks in using the gorilla cart is the bulkiness of it. Some people simply prefer the nifty design of a classic wheelbarrow instead of a rectangular cart. Since it is a bit boxy, some people may be turned off in the storage space it would take. You can’t easily hang up a gorilla cart like you could a smaller wheelbarrow. Another drawback is the axels. Any tool needs upkeep, but if you left the gorilla cart in the rain, the wheels’ axles and washers could easily rust. Since this tool has four wheels, it would be in your best interest in keeping it in a shed to protect it from rain and rust. Hopefully you’ve found all this information on wheelbarrows and gorilla carts useful enough to help you make a decision. Each tool offers so much efficiency in use that it may be a bit tough, but just remember to assess the job you’ll be using it for beforehand to help make the decision. In my personal opinion, the gorilla cart would be the better tool since you can move it around so much easier than a wheelbarrow. The gorilla cart just seems sturdier and the fact that you don’t have to lift it to move it is a great plus. If you have any experience using a wheelbarrow or gorilla cart, leave your advice in the comments so we can get even more perspective! Thanks for this informative article! It seriously helps as I just got some beds and am having to get 4 yards of topsoil to an inaccessible back yard.